Yes, I will admit it, "a tale of cannibalism" is what drew me to this book, I am strange. But I stayed for so much more! I did a lot of anthropology coursework in college and also I grew up in a small Christian denomination that heavily emphasized missions and so I grew up hearing stories about cultures all over the world...the less glamorous ones (so to say) and that's something I'm really thankful to my childhood for. Reading this book reminded me of those stories and of anthropology and I think that greatly contributed to my enjoyment of it. Plus, one of the things I'm discovering that I love about this kind of narrative nonfiction is seeing how things are developing in different areas and then clash together creating whatever dramatic event is being written about. So here you have a description of life in New Guinea among the Asmat and how different their culture is to ours. Which...is like the understatement of the year. Everything about their lives was different and this of course included headhunting and cannibalism. Throw in some Western invasion and you start to get the picture. And then you also have the story of Michael Rockefeller who came to New Guinea in search of primitive art which was becoming quite popular and was especially collected by his father. Rockefeller disappeared while in New Guinea and the official story was that he drowned. However, there was a lot of rumors that maybe he was actually killed and eaten by the Asmat and so Hoffman decided to investigate the history and see if he could learn what really happened. 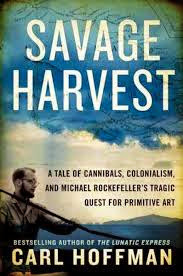 Throughout the book he retells the history of New Guinea--the revenge killing, the headhunting and cannibal traditions, the Dutch trying to establish authority, the arrival of Catholic missionaries, Rockefeller's time in New Guinea, the search for him afterwards, etc. He intersperses these chapters with stories of his own visits to New Guinea, the efforts he made to research the history, interview key eyewitnesses, etc. It all makes for an incredibly engaging and compelling read. I thought the stuff about how the art was so much more and everything had spirits attached was really interesting because I remember when I used to visit the St. Louis Art Museum and go to the floors with the tribal art that it always felt really creepy to me. Of course it was probably that missionary influence--they'd tell us about the evil spirits the people believed in, but still!! I also think Hoffman touches on part of why a story like this is so interesting...there's some sort of fascination with the idea that a rich young white man can be so vulnerable in the end and end up as nothing more than food--like when he recreates the scene in the beginning of the book you're sort of like...WAIT! It shouldn't be so easy. In any case, a really interesting read, and pretty fair I think!